Thanks to Johnnie Rogers who spotted this article from 5th March 1958 whilst browsing through some old ‘Amateur Photographer’ magazines. It seems feedback from clubs in Wales had waned and Amateur Photographer hoped to revive interest in its weekly column. 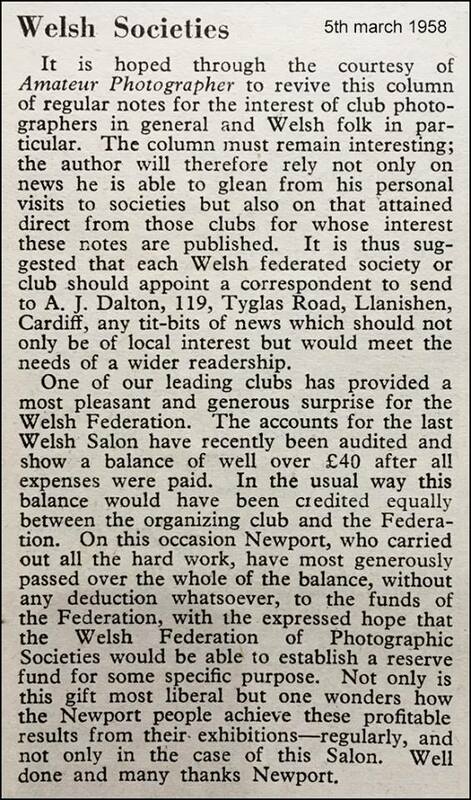 The WPF came into being in 1951 and was initially a Federation covering the whole of Wales. Later, in the early 1970s we think, the clubs in North Wales split away to form the NWPA. A full list of WPF Past Presidents can be found on our history page here.